Bring your family, friends and neighbors to the Zoo on November 5, because Zoo admission is FREE! (Regular parking and concession fees apply.) 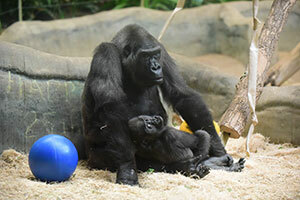 While you’re here for Family Free Day, come see how much our youngest western lowland gorilla, Sulaiman, has grown! Sulaiman, whose 2nd birthday is on November 24, is now tall enough to touch the top of a 3-foot door if he stretches. Zookeepers report that he is very active and enjoys bouncing on the bungee toys and fire hose, as well as teasing the others in the group, hoping to entice someone to play with him. Although he interacts with everybody, Sulaiman’s favorite playmate is 54-year-old, Femelle, the “grandmother” figure of the group. She is very tolerant of his rambunctious play, but can always settle him down if it is too much. Sulaiman remains the center of attention within his family group, which is typical for gorilla society. Come visit Sulaiman in the Stearns Family Apes of Africa exhibit today and wish him Happy Birthday!